Trading Account is an account that is prepared by the entities to know the profit earned or loss suffered from trading activities. On the other hand, Profit & Loss account is an account created to ascertain the net profit or loss for the period. This article excerpt deals with the difference between trading and profit & loss account. There are two types of entities, i.e. manufacturing entities and non-manufacturing entities. Non-manufacturing entities are the entities engaged in trading of goods, without converting their form, meaning that they sell the products in their original form. At the end of the accounting period, it is important to identify the profit earned or loss suffered by the firm. For this purpose, the financial statement is prepared. Financial Statement is the final product of the accounting process that involves the preparation of the summary of accounts, which are presented in a way that they depict the financial position and performance of the undertaking clearly. Financial Statement is divided into two parts, income statement and position statement, wherein the former is further sub-classified into a trading account, and profit & loss account and the latter includes Balance Sheet. Meaning Trading account is an account which indicates the result of trading activities, such as purchase and sale of products. Profit & loss account is an account, representing the actual profit earned or loss sustained by the business during the accounting period. Preparation It is prepared to ascertain gross profit for the period. It is prepared to ascertain net profit for the period. Transfer of balance Balance of trading account is transferred to Profit & Loss Account. Balance of profit & loss account is transferred to Capital Account. Accounts for Direct revenue and direct expenses Operating and non-operating incomes and expenses. In the income statement, trading account represents the first part, which is prepared to know the gross result, i.e. profit (loss) for the period. The account shows the outcome of trading activities, i.e. the profit earned or loss suffered on purchase or sale of goods. The account consists of two sides; debit side indicates direct expenses and credit side is for direct incomes. Direct expenses which are incurred by the organization, to bring goods into the condition, fit for sale. Such expenses include fuel, power, freight, insurance, carriage inward, consumption of stores, etc. On the other hand, direct incomes refers to income from the activities that are earned from the sale of goods. Profit and loss account is a part of the financial statement, which takes into account operating and non-operating revenues and expenses incurred, during an accounting period. It ascertains, net profit earned or loss sustained by the business. Profit & Loss account is prepared after the preparation of trading account, with the help of trial balance. The balance of trading account is transferred to this account, which acts as the initial point, after which all expenses and losses are debited, and all incomes and gains are credited to this account. When the debit side of the account exceed the credit side, it is a net loss, and when the credit side is more than the debit one, the result is net profit. The balance (net profit or net loss) is transferred to the capital account, on the balance sheet. Trading account is a part of the financial statement, prepared by the entities to show the result of trading activities, i.e. purchase and sale of goods. 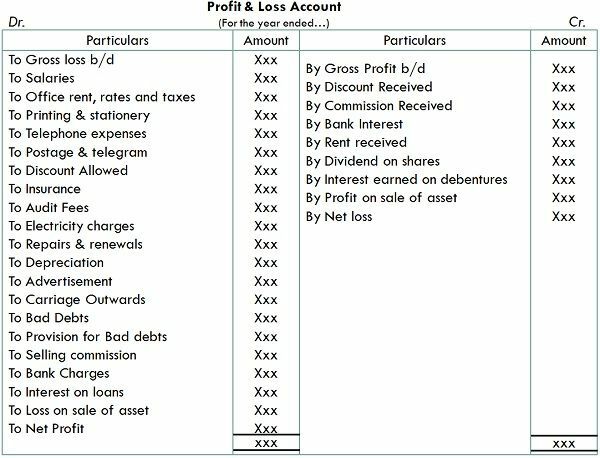 On the other hand, profit & loss account is an account indicating the actual profit earned or loss sustained by the business during the accounting period. Trading account determines the gross profit or loss for the accounting period. As against, profit & loss account ascertains the net profit or loss for the given period. The balance of the trading account is transferred to the trading account, whereas the balance of profit & loss account is taken to capital account, in the Balance Sheet. Trading account is a summary of all direct revenue and direct expenses. Conversely, Profit & Loss account takes into account all operating and non-operating incomes and expenses. The main purpose of preparing financial statement is to identify the profit earned or loss sustained by the entity, during a particular accounting period. These two are nominal account and reflect the performance of the entity. These two accounts are nothing but a summary of incomes and expenses of the business, which reckons the net amount, i.e. the profit and loss from the business. If revenue exceeds expenses, then it is a profit, whereas if expenses are greater than revenue, then it is a loss.